Shaelmaar is a Creature/Monster in The Witcher 3: Wild Hunt. Added with the Blood and Wine expansion. "The earth’s innards are home to mighty strange and fearsome beasts. Were they ever to decide to ramble up to the surface, we’d all be gutted the very first day o’ the invasion. – Ramus Vendenratz, Mahakam foreman. Shaelmaars spend most of their lives deep underground, having no contact with the world up above. 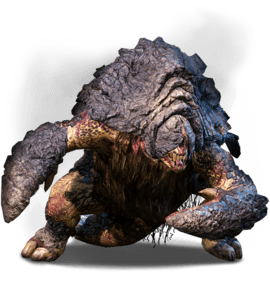 At times, however, a shaelmaar will dig its way to the surface and devour any men within its reach. Some shaelmaars also burrow tunnels close to the surface, collapsing buildings and causing tremors in the process. Since shaelmaars are blind, they find their way by sensing vibrations and listening for sounds. Thus the best tactic when fighting such a monster is to hurl something heavy or noisy against a nearby boulder or wall. Then pray silently that the beast will roll towards the sound and knock itself out upon striking into the obstacle." Associated Quests: Vintner's Contract: Griffin-in-the-Vines, What Was This About Again? When Shaelmaars curl up they are invulnerable to attack. They can dig themselves in, then start batting rocks in all directions. Shaelmaars will often leave themselves open after attacking. Igni is also effective against them. Axii is ineffective as it makes them curl up.